Outer Material: Leather. Sole: Gum Rubber. Lining: Textile. Size UK 6 (EU 39). Used, great condition. 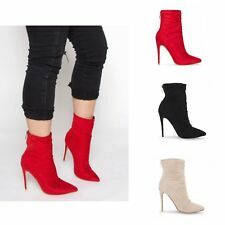 Pointed toe, stiletto heels and side zip fastenings. Surprisingly comfortable! Pleated/wrapped front ; buckle effect to outer side of each boot. Hardly worn - see pics for condition. Ladies pointed toe Black Stiletto Sock Boots Size 6- Brand New with box. Dispatched with Royal Mail 2nd Class. Step stylishly into your new-season style with the elegant GEMIE boots from Ted. Condition is Used (as seen in the pictures). Slanted heel. Ted Baker footwear collection. Care information: Brush with a suede brush or suede block. DUNE Black Stiletto Shoe Boots ~Size 6 / 39. Condition is Used. Dispatched with Royal Mail 2nd Class. Public desire black high heel ankle boots. Patent and contrast faux leather. SIMMI London. Khaki Faux Suede. Lace up ankle boots.